Explore the city of Boston with the whole family in tow. This highly-walkable city is teeming with fun activities appropriate for kids of all ages. From museums to tours and outdoor activities, Boston is full of enough attractions for any family-friendly vacation or day trip. Boston's iconic Freedom Trail is one of the easiest ways to visit all of the must-see Boston historic landmarks. This 2.5-mile route takes visitors to sixteen historic sites, including the Boston Common, Old North Church, and the site of the Boston Massacre. 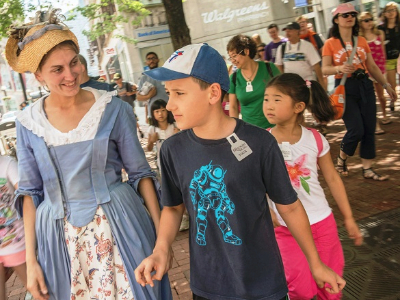 Visitors can explore the Trail on their own or can join one of The Freedom Trail Foundation's guided tours, led by 18th century-costumed Freedom Trail Players who share stories along the way. "The Freedom Trail is a great stop for families because it has something for everyone to enjoy," explains The Freedom Trail Foundation's Creative Manager Sam Jones. "Parents enjoy the history, kids enjoy the stories of daring midnight rides and Sam Adams Mohawks dumping tea at the Boston Tea Party." In addition to the stories, kids love the Freedom Trail Players in their stylish Colonial ensembles," Jones says. 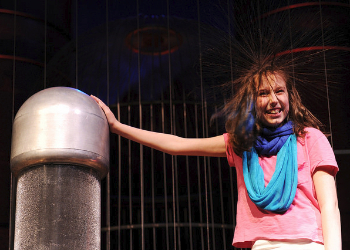 Boston's Museum of Science is another top spot for families visiting the city. As one of the largest science centers in the United States, the MoS is teeming with fascinating exhibits and fun hands-on activities. Permanent exhibits explore dinosaurs, light, engineering, the environment, and much more, all presented in a highly-accessible format that kids and adults will both enjoy. The popular "Science in the Park" exhibit, for example, teaches visitors about physics using familiar objects in a park-like setting--kids can hop onto swings, balance on a seesaw, and life a 500 pound bag of sand with a giant lever. Kids can get up close to a fascinating collection of marine life at the New England Aquarium. Octopi, sharks, rays, seals, and more call the Aquarium home, and the Aquarium incorporates technology and interactive activities in order to educate visitors in a fun and accessible way. The Trust Family Foundation Shark and Ray Touch Tank, for example, allows visitors to have a close encounter with cownose rays, Atlantic rays, and epaulette sharks, while the enormous fourt-story Giant Ocean Tank is home to hundres of Caribbean reef animals, such as sea turtles, stingrays, eels, and fish. 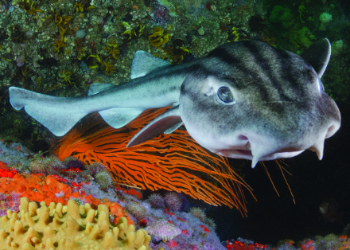 NEAQ's newest exhibit, Science of Sharks, showcases a wide range of shark species in new tanks that allow visitors to get up close to the sharks, and also incoporates a new Sharkwall, which uses giant screens to display the photography and video footage of National Geographic underwater photographer Brian Skerry. "For kids, this is one of the highlights," says NEAQ's Media Relations Director Tony LaCasse. "All of a sudden, they're two feet from a shark on the wall. It sends a jolt through their bodies." For visitors looking for a day trip, the Boston Harbor Islands National and State Park is just a ferry-ride from Boston. Consisting of thirty-four islands and mainland parks, the BHI is the largest recreational open space in Eastern Massachusetts. Georges Island and Spectacle Island are the most popular destinations for day visitors. "Spectacle Island is where we have most of our recreation programs," explains Jessica Renehan, the park's Program Coordinator. "We have yoga classes for the public, a tai chi program Sunday jazz concerts, Monday kayaking, and kids activities, just to name a few." Georges Island is home to Fort Warren, a military fort that was built in 1783 and was active through World War II. Today, families visiting the island can explore this historic fort. 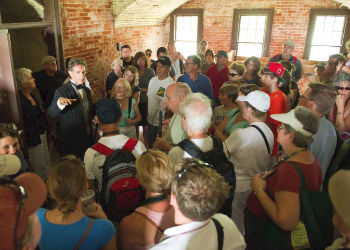 "Visitors get complete access to Fort Warren," Renehan says. "You can get inside, explore the rooms, find really cool nooks and crannies. You can feel like a kid and go exploring." 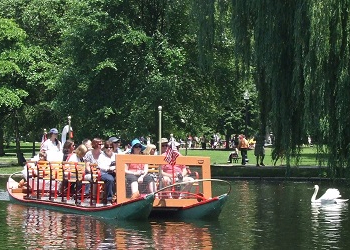 There is no better place to enjoy an afternoon in Boston than by taking a ride on the Swan Boats. Located in the heart of the Boston Public Garden, this iconic landmark attracts visitors of all ages. "The Swan Boats are one of the symbols of the city for visitors," says Lyn Paget, fourth-generation manager of the Swan Boats. "They're featured in a lot of famous photographs and artwork, they're in Make Way for Ducklings--walking through the Garden and seeing the Swan Boats is a great experience for visitors." For families, the Swan Boats are a great way to wind down a busy day of activities and sightseeing. "We don't allow people to talk on their cell phones, so they are forced to have that experience," Paget explains. "It forces this affection between people who come together--the sounds are very peaceful, and people are surprised at just how transformative and relaxing it is. It's an oasis in the middle of the city."